In between concerts, there were two Music Talks presentations. On July 17 composer-in-residence Shulamit Ran (photo left) and composer Waggoner treated us to a most edifying and entertaining informal chat about their compositions called “An Evening with Shulamit Ran” at the Catskill Distilling Company in Bethel, and on July 24 at the North Branch Inn “Finding Common Ground: Music, Dance & Improvisation” was held with guest dancers and choreographers Donlin Foreman & Jennifer Emerson. “String Crossings: Improv and then some!” was a free concert held on July 20 at the Callicoon Farmer’s Market. Happily, I was able to attend the July 17 talk and the July 19 and 26 concerts of this most impressive, carefully prepared series, for which much thought was given to creating a fortnight of opportunity for people to not only hear standard masterpieces performed by world class artists, but to hear, and in my case, to be exposed in-depth to, a whole new language of musical composition. The July 19 concert gave us music by Ran, Waggoner, John Dowland and Brahms. 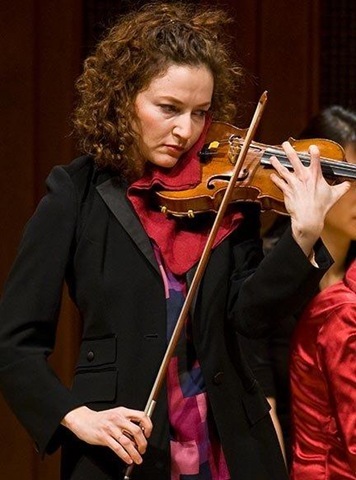 On July 26 we heard music by Ran, Waggoner, Ravel and Mendelssohn. It is difficult for me, a non-musicologist, to explain what is technically involved, composition-wise, that makes the music we heard so incredibly diverse in its breadth. So let me just say that “incredibly diverse in is breadth” really means to me a few things – being awed at the wonders presented to us, boggled with a myriad of not-so-easy musical languages that never lack an emotional punch, and deep gratitude that we can hear programs like this close to home. Perhaps if I WERE a musicologist, I could have said in reference to Ran’s music, and I quote, “a play of contrasts between harmonies both supercharged and still, between homophony and dense polyphony, all through an atonality that manages to be unaggressive, never sinking to demagoguery. The writing, beautifully clear, captures the ear throughout.” Dernieres Nouvelles d’Alsace, Strasbourg, France. Other than discovering a new musical language, highlights for me were – in general – the masterful playing of the superb, world class WCM performers, easily noted in the “standard” music of a Brahms sextet for strings and a Mendelssohn piano trio played by, respectively, Michael Jinsoo Lim and Sunghae Anna Lim, violins; Melia Watras and Tawnya Popoff, violas; Julia Lichten and Caroline Stinson (photo right), cellos – and violinist Nurit Pacht (photo below left), cellist Stinson and pianist Tannis Gibson. Also in general – the shining forth in the “new” music by all of the above and by WCM founder Judith Pearce, flute and Carol McGonnell (photo below), clarinet. I cannot wax ecstatic enough on the brilliance of their individual and their ensemble musicality and phrasings and to what emotional heights they brought the audiences. Yes, there were a couple of non-general, specific highlights for me, all because of my excitement over their newness (to me) and unfamiliarity (to my ken). · An improvisation by Waggoner on his magic violin and Melia Watras on her magic viola with a superlative back and forth, to and fro, yin and yang dialogue. · Ran’s “For an Actor” for clarinet solo for which Carol McGonnell amazed the audience with not just her devilish Paganini-like technique, but with what wonders can actually be performed on a clarinet. For his “Sonata for Violin and Cello,” Ravel chartered new waters after Debussy’s La Mer and their subsequent “marriage”, cemented in impressionism. Ravel dedicated the work to Debussy following Debussy’s passing, and I can see why. I am sure Debussy NEVER imagined to what degree impressionism could soar and could innovate contrapuntally and structurally. Some say Beethoven is the father of modern music, some say Wagner, some say Liszt. But with this piece, Ravel is a true harbinger of what is to follow, the bridge between tonal and atonal, the bridge between reveling in what has been and in being mesmerized with what is possible. Kudos to Pacht and Stinson for helping me melt and lose myself totally with their fantastic back and forth, to and fro, and, yes, yin and yang dialogue, Stinson can’t help but shine, no matter what music she is playing; every note, every phrase, is meticulous and musical and magnificent. 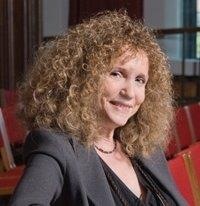 Gratefully, I’d like to thank Shulamit Ran for coming to Sullivan and gracing us with her charismatic presence. And on a personal note, I’d like to thank WJFF deejay Gandalf for his Monday Afternoon Classics radio program for which he airs 20th and 21st century music, without which my ears would not be as open as they are to receive what Ran and Waggoner hath wrought (what is the 3rd person plural of hath?) and, perhaps even the reason for the audience’s ability to appreciate what is truly complicated music – as I know most of them listen to his program also. I’d like to thank the audience too, for their attentiveness and appreciation of what was given to them (us) on a uranium platter. Their stillness and their silent participation was noted and felt in the energy and vibes surrounding me making it all the more of an awakening for me.